This chapter focuses on Jean Rhys’s four early novels, written in the 1920s and 1930s, as engaging in a trenchant engagement of the reality of multilingual praxis and its implications for the formation of social and political identities. 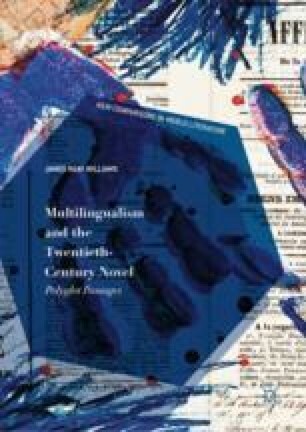 Williams reads in them a series of multilingual writing strategies and motifs which are unusual among modernist texts in their drawing attention to the realities of language praxis and language learning. Far from being dispassionate deployments of formal mastery, the multilingual characteristics of Rhys’s writing foreground moments of mistranslation, misunderstanding, performance and aphasia. Ultimately, the chapter concludes, Rhys’s deconstructions of identity and of language ought to be made central to our understanding of the twentieth-century novel and its engagements with language diversity and language politics.